Doha will host the 10th International Handball Federation (IHF) Super Globe Championship, which will be held at Qatar Handball Association (QHA) Hall in Duhail from September 5 to 8. 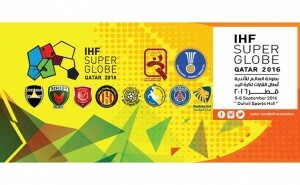 Al Sadd and Lekhwiya will represent Qatar in the championship, which QHA has been hosting since 2010. Fuchse Berlin are the defending champions. The German wild cards beat Hungarian club MKM-MKB Veszprem in over time in last year’s thrilling title clash. Sydney University (Australia), HC Taubate (Brazil), Paris Saint-Germain (France), Vive Targi Kielce (Poland) and Esperance Sportive de Tunis (Tunisia) are the other teams competing in the tournament featuring continental champions.